From 1st January 2013, pig farms had to adapt their facilities to the Animal Welfare Law. A law that wants to guarantee that animals: do not suffer from thirst or hunger; do not suffer any physical or thermal stress; do not suffer any pain, injuries or diseases; have sufficient space to move and do not have any suffering. The Animal Welfare law was first settled in gestation and fattening. In farrowing though, no regulation has been stablished yet. 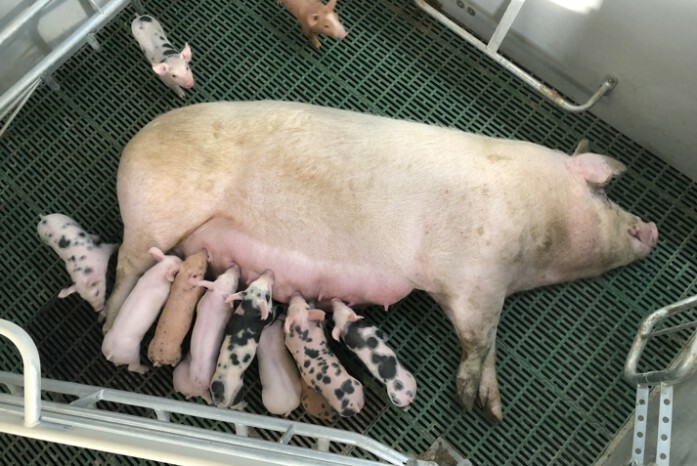 The majority of sows are kept housed in farrowing crates once they have given birth to their piglets, to reduce piglet mortality. Keeping the sows in crates ensures the risk of piglets being crushed by the sow, particularly when lying down, and ensuring the higher percentage of living piglets. However, this type of crates go against premises of the Animal Welfare law, in terms of space. In recent years, yet no stablished regulations are set, in terms of space, for the sow in the farrowing pens, several Welfare farrowing pens have appeared. These pen have the common farrowing crate, for the sow, to ensure piglet birth without crushes. The sow will be kept in the crate when giving birth and the following days. After that, the farrowing crate can be opened up to allow the sow to turn around in the pen, letting her to lay down wherever she wants. Crate’s fingers and some strategical side bars, will avoid any possible piglet crush. There are a number of things to consider when installing any flooring in farrowing pens. Plastic slats are the most suitable. This type of slats are non-slip, have good drainage (which reduces considerably possible piglet’s infection), more hygienic and easier to clean, though animal walk inside the pen reduces manure and keep the pen cleaner. It is important to have strong support structures under any slats, due to sows will be moving about more than in conventional systems. The pen has to have a creep for piglets which has to be inaccessible to the sow. This Area has to provide supplementary heat and feed. It is important that this is placed where it can be easily inspected by staff. Placing sows in Animal Welfare crates has been proved that sows are quieter and can nurse their piglets longer. So when piglets have to be moved into weaning, they will be stronger and healthier. ERRA has already trusted in this system and we have already set in successfully our first facilities. Both, pen and farrowing crate are manufactured in high quality materials, to ensure its durability. Besides, we have assigned several technical details to ease handling to the most demanding stockbreeders.